The Mime Order by Samantha Shannon is a tour de force of non-stop thrill and adventure. Across the course of The Mime Order, it's easy to see where Shannon's strengths lie. She's a puppeteer author, who exercises careful control throughout her meticulously plotted novel, playing with pace and tone to create an intense and unpredictable sequel to her much-loved debut. Fans of The Bone Season honestly won't be disappointed. MY THOUGHTS: So here we are, starting where The Bone Season left off. Paige has fled Sheol I, leaving Warden behind her, only to realise the danger has yet to fade; she's London's most wanted, and a handful want her dead. And so our heroine's tale continues – and, at a hefty 500 pages, she has a long ride ahead of her. If anything, it's a testimony towards the ingenuity and intrigue of Shannon's creation that four words are able to arouse such excitement within a reader – Welcome back to Scion, indeed. The Mime Order succeeds on many levels – characterisation, world-building, plot – but, most of all, it succeeds in standing as a tale in its own right. In a series of seven, it's easy to assume the second book would merely act as a 'bridge' between the beginning and the middle. Instead, what we have here is a conformation that Shannon's series is strong enough to sustain this lengthy tale, without it ever becoming dull or falling into the trap of info-dump. Furthermore, the freedom allowed for major plot twists (buckle up for the ending, readers), allows the sense of unpredictability to remain. In fact, in many a way, The Mime Order succeeds at everything The Bone Season did – and, indeed, didn't. Given the vast amount of world-building was conducted throughout The Bone Season, The Mime Order left a lot more room for character development. In particularly, Paige's flaws – specifically, her impetuous, and sometimes irrational, nature – became more apparent, thus creating a more rounded character. On a similar note, I feel as if the relationship between Paige and Warden was dealt with wonderfully throughout The Mime Order – it's subtle and understated, not detracting from the plot. Another fantastic element of The Mime Order is that it never fails to surprise. Small details, such as the moth symbol's true meaning, as well as new, unexplored territory, like the catacombs of Camden, made for a real delight. Simply brilliant. This all said, it's important to note that The Mime Order does rely on the reader having a strong recollection of the previous book in the series. So, my advice? Give The Bone Season a quick reread or skim through beforehand. I'd also like to note that, despite the somewhat slow beginning, The Mime Order really does speed up as the novel progresses – and it's definitely worth the bumpy start. Overall, The Mime Order is a novel of epic lengths. In my review of The Bone Season, I said this is a series I'll be following from start to end; now, I am able to say this is a series I'll be reading and rereading for years to come. 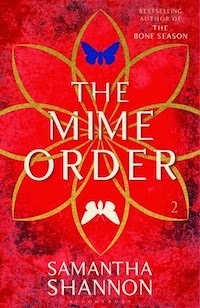 The Mime Order is a distinctive mix of well-paced action and astounding creativity, tied together by stunning prose –“Safe inside my dreamscape, I curled up inside the poppy anemones, drenched in the warm blood of rebirth”. I've already preordered this book! I loved The Bone Season and I'm glad this one matched your expectations. Sentences in your review like "it never fails to surprise" make me so excited! And that quote you included is to die for omg. Ooh if you enjoyed The Bone Season then I'm certain you'll loooove this! And yep, TMO has some pretty big twists ehehe. The quotation I included is from the first few paragraphs – which were wonderful. Excellent review. I agree with you on every point, I loved it more than The Bone Season, it was just so SOLID! I've already won this book, and I am just waiting for my copy to arrive! It looks like a great series. Thank you! I hope you enjoy it if you read it anytime soon!